Bar holes can be dangerous to pedestrians, cyclists, and motorists. Not filling bar holes can lead to problems when they grow into potholes. 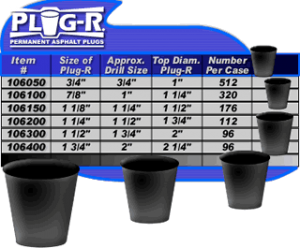 Sand, chunks of asphalt, even regular patching doesn’t fill a hole permanently – PLUG-R does. A specially formulated asphalt plug that stays right where you want it … in the hole! Cold weather won’t crack it, hot weather won’t melt it. They’re easy to use, store, and transport. Goes in quickly and looks great. No extra filling necessary. PLUG-R saves time and money. PLUG-Rs are packed loose in cases. A special release material is used to keep them from sticking together. Place a PLUG-R in the hole, cover with a board and pound in with a hammer. Then hit the PLUG-R directly with the hammer to break off any excess asphalt. The PLUG-R is now part of the pavement.